My name’s Clare, I’m a publicist with a long career in book publishing. I love reading, swimming, cooking and the outdoors. I’m a wife and mum of twins living in London. Today I messed up. Not big time, but big enough time. It was drizzling when I got to the lido. I clocked the temperature gauge and joked with the manager that I was trying to kid myself there’s not a big drop between 11’C and 9’C. I respect the lido lifeguard team, if they’re on duty they swim, come rain, snow ice and sun. So if they say it’s cold, it is. I like the way they clock who’s at the pool, they know the regulars and they ask after faces they don’t recognise. They are true life savers. In I went. Instead of stinging, the water had a sharp burn-like edge to it. It wasn’t properly painful – that joy comes when the mercury is a little lower. We’d worked out I can complete the 22 mile Aspire challenge to swim the length of the English Channel with just 3 more swims of 16 lengths. If you’d like to sponsor me, and I’d be very grateful if you did, pop along to Just Giving. So I set out to do 10 and see how I felt. At 12 lengths I thought I’d go for 14, so I did a real spurt, then stupidly I thought I’d stay for just 2 more lengths, that’s another 120m. As I turned into the final length I did a wobble, something wasn’t right, but instead of powering to the side I carried on. I got to the end, had more trouble than normal getting into my flipflops and enveloped myself in the blue lined duvet aka Dryrobe. In the changing room I could feel all wasn’t well. My lips were swelling, and when I tried to talk to another lady the words came out in the wrong order. Everything slowed down, I decided to take a selfie (muppet? yes). I did another wobble on my bike and then cycled home faster than I have ever done. I got home and luckily everyone was in, so I was bundled up onto the sofa with blankets, hot water bottle and tea and then the double duvet. After 20 minutes the shivering had stopped and all was well in the world. Lesson learned. At 9’C quit when you’re ahead. 20 minutes is 5 full minutes too long in the water. No matter how good the kit is that you put on afterwards once the body reaches a certain level of chill it needs many layers and much warmth. In the meantime we have no hot water or heating at home. The cheery gas engineers came yesterday to install a new meter and give our appliances the once over. Apparently the fire’s flame is too high and too yellow, so they summoned the National Grid engineer who shut off all our gas at 6pm on Friday night. You can’t mess with carbon monoxide, but it would have been good if they’d disconnected just the fire. I didn’t realise it should’ve been serviced annually, so please learn from my mistake before you end up in a cold house in November. In theory our Knight in Shining Armour aka gas engineer will be here at 7pm tonight to do a service and reconnect us. 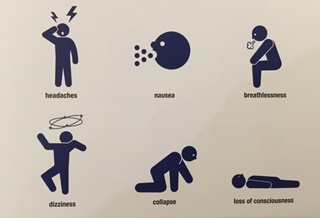 The illustrations in the gas safely leaflet seem rather apt so I’ll sign off with them – I did a good demo of the dizziness one today. Lovely to have your blog brought to my attention. I am the Fundraising and Marketing Director for Aspire – for whom you are doing such a fantastic job raising money and now going way beyond the call of duty! Do be careful, won’t you? Oh my, I relate to so much of your experience at Parliament Hill Lido. I started training there out of season and had some very wobbly moments at times. 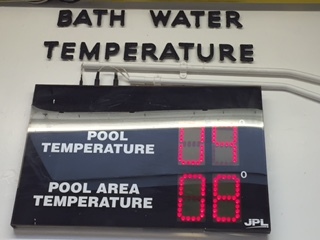 The metal bottom of that lido means that it can achieve cold temperatures like no other lido. That “burn” from the water is such an apt description. The there is that strange sense of well-being that you also experienced which makes you swim further than you should. 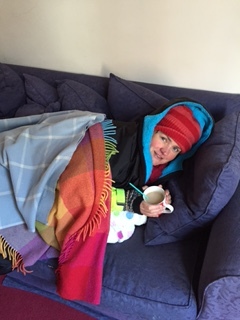 How you cycled home, I don’t know and to arrive back to no heating – dear me! We have decided that you are our toughest swimmer of 2016 – and that includes the 36 who relayed across the Channel for real in Summer. Thanks for deciding to support us and take on the challenge – we really appreciate it. Would you mind if we ever had the chance to use your story for publicity purposes? Paul thank you so much for getting in touch. I’m so pleased to know that my post has founded other Parliament Hill swimmers, like you. It’s the most magical place. I’m not sure I’m deserving of your accolade, I’m pretty sure there’ll be others swimming outside beyond the lady I’ve discovered in Shropshire via the Outdoor Swimming Society facebook page. I am your most terrible fundraiser, but there we go. I’d be very happy for you to use my story so let me know how I can help. 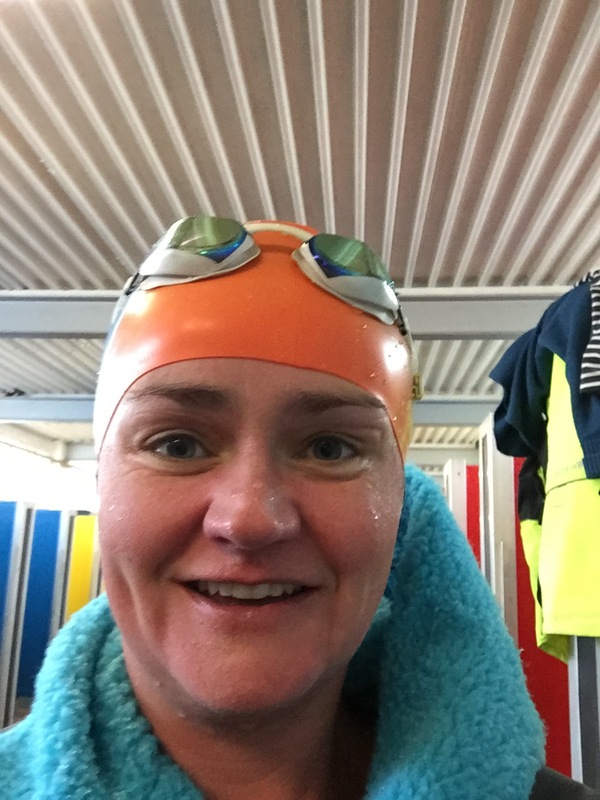 By coincidence I’ve applied and done a self test film to be in the next version of #ThisGirlCan, should I make it through to the next round I will be sure to give you a plug. Would you like to follow the blog by email?